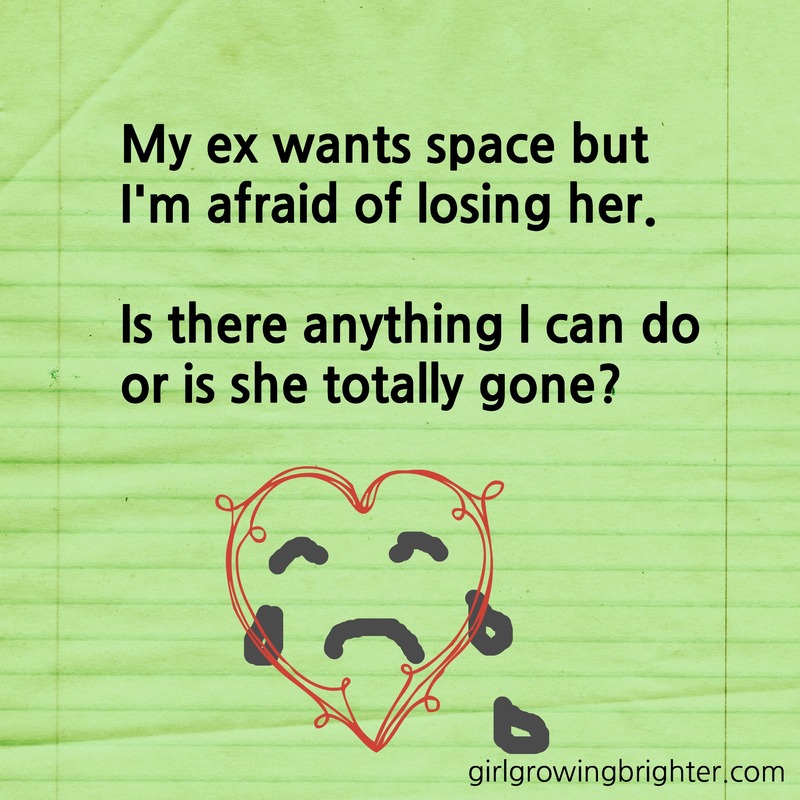 Dear Elisa: My ex wants space, but I’m worried about losing her. Is there anything I can do? My gf broke up with me about 3 weeks ago after absolutely no sign of it coming. We had already discussed marriage and kids. We promised each other we’d work through anything that came our way and we’d never hurt each other. Anyway, since then we’ve been going round and round, me trying to get her to give me another chance, to fix the reasons we broke up (which are very easily fixable I might add) and she says she needs space and I’m not respecting that. I’m afraid if I give her space though she’ll just become even more detached and won’t have any feelings for me anymore. Is there anything I can do or is she totally gone? I’m sorry to hear about your breakup. You are in a tough situation. But you sound very self-aware of what you are doing and why. Which is awesome. This is what I think: Your ex-girlfriend is totally gone. You have to respect her need for space because you respect her. 1. She will come back to you after getting her space, and realize she was wrong. In this case, she will want you back. But you are not in control of either of these options. So what ARE you in control of? You are in control of how you present yourself and the last impressions you make (if it makes you feel better, know that your last impressions could influence whether she goes in Direction #1 or Direction #2). What can your last impression be? I suggest that you do something loving, without expectation, that will clearly express your feelings for her WITHOUT asking for a reply. Your last impression should be something that also gives you peace. CAUTIONARY NOTE: DON’T say anything self-interested like, “Someday I hope we will be together again.” Don’t make it about you. That will take away from all the nice things you will say. You get the idea. Be honest. Be dignified. Well…. it doesn’t have to be a letter. But if your letter is nice enough, she will keep your letter until her dying day, whether or not she ever talks to you again. When you sign off your letter, sign out of her life. Let her make the next move. You will be heartbroken, but you will be able to pick yourself back up again. I promise. Love is one of the few things that you get more of, the more you give away. Good luck to you, dear J.
PS: This was posted in the comments section of my blog. However, I thought that others could benefit from it. Hence my choice to use it as a blog post. Thanks for sharing, can I post it on my Twitter to share to my friends? так Я собираюсь рассказать ее.